Spanish artist Julio Anaya Cabanding has a deft hand, and he enjoys putting it to good (and unusual) use. 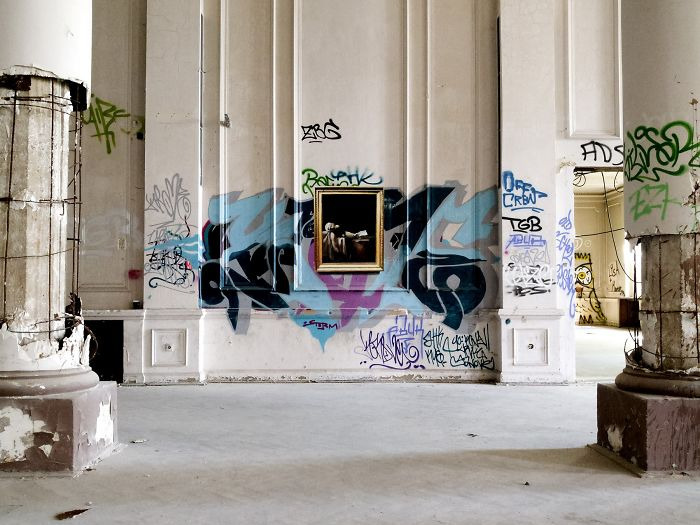 Cabanding recreates famous works of art and hangs the paintings in abandoned places: inside dilapidated buildings, layered over graffiti, and so on. Though his recreations — of paintings by Monet, Vermeer, and others — look framed, Cabanding’s detailed process is entirely two-dimensional. By layering colors and shades, he’s able to create the illusion of frames. This, juxtaposed by the grittiness of abandoned environments, makes his work a feast for the eyes. Keep scrolling to learn more about his process, and to see some of his edgiest displays. Cabanding paints adjacent to a photo of the actual painting to ensure accuracy. Cabanding uses acrylic paint, and often mixes his own colors to make sure his replica is on par with the original. First he sketches an outline, and then he fills it all in. He’s truly a master of recreations: you can barely tell which one is real and which is a replica. Here, Cabanding recreates „Head of Study“ by Fernando Labrada Martin. Look closely at his sketch — you can see the frame is included.